From The Director | His Kids Too! The U.S. spent 15 million on bottled water in 2007! And less then .5% of churches offer any assistance to orphans. Staggering statistics that can’t be ignored. I was first drawn to Ukraine in 1994 when a need for clothing was brought to my attention. Having the resources to provide for this need, we started to send clothing and shoes through a missionary friend to the country of Ukraine, to the small coal mining village of Dzerzhinsk. It seemed quite insignificant, but little did I know how God was preparing the foundation to launch a ministry that would eventually reach thousands. With the support of family (we adopted 2 children from Ukraine in 1999 and 2002) and friends, His Kids, Too! was formed. It has always been my desire to help the less fortunate, and God continues to provide pathways to meet that challenge. He continues to provide energy, resources and people to sow His seed into the soil of Ukraine. Each time I visit this wonderful country, I’m greeted with more and more requests for assistance. How can I look in the eyes of a director and say, “we can’t help you…we have nothing for your children”? It is impossible for me. How do I look at physically and mentally challenged children, and not help them…one can’t. I want to personally thank each of you for your continued support for the faceless, nameless, fatherless, motherless, poor and needy orphans of Ukraine. Without your help, children would not have basic essentials for life or hear about Jesus, and His life saving blood, and that truly their only hope is in Him. As I look to the future for His Kids Too!, my vision is not only continuing to reach the children (which are Ukraine’s future leaders), but also present officials. 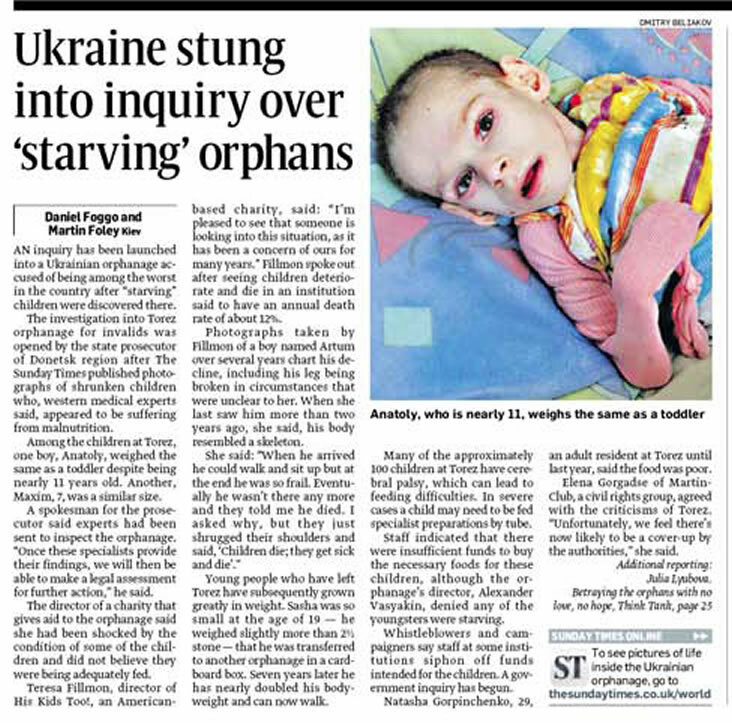 They need God as much as anyone, and they have the power to make changes NOW for orphans in Ukraine. The situation for some children is quite critical. If change is not made, they will die in institutional care. The physically and mentally challenged are at greatest risk…they need our prayers, encouragement and support. My heart cry is for these voiceless children and my prayer is for continued wisdom as to how to approach officials on their behalf. Adoption of orphaned children is only one answer to the problem, because the majority will never be adopted. The masses will be sent into society ill equipped to meet the challenges of living a productive life. This is why the teen health program is vital to Ukraine. Transitional living facilities another vital program. And lastly, yet at the front of my mind, is a Christian Children’s Home, where children will be raised up in the Lord, being taught the ways of Christ, and in turn desiring to serve Him, and their community. I hope that each of you will desire this too, and make every effort to be a part of this vision.